Now you can brand yourself as an industry guru and attract the specific niche clients you want to work with! CDI is proud to offer the Certified Resume Specialist (CRS+X) designation which can be earned in 18 (and growing) specialty areas. 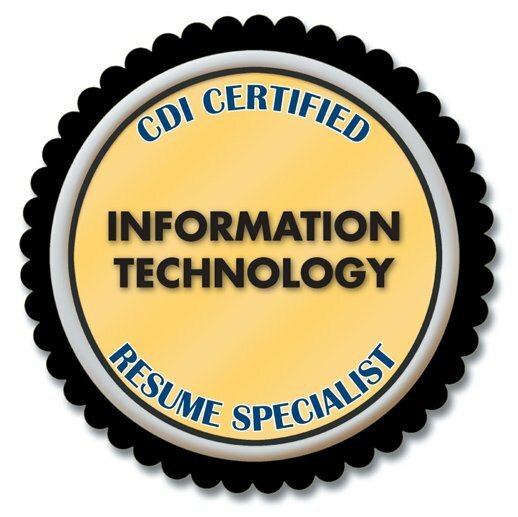 The CDI Certified Industry Resume Specialist allows you to gain certification in your chosen industry. For example, do you love creating resumes for the IT industry? Then become a Certified IT Resume Specialist (CRS+IT) through CDI. Promote your brand as a leader in IT resumes and build the type of lucrative niche for yourself that will continue to gain momentum as referrals and recognition grows. Enjoy working with engineers? Then you know how specific the field is, and you know the industry values credentials and experience. Develop a stronger client base as an industry leader by securing your credential as a Certified Engineering & Science Resume Specialist CRS+ES) through CDI. We’ve launched this groundbreaking initiative with 19 areas of specialization (and growing) that we believe are the most sought after in the resume industry, but the list can, and will grow as you, our members demand. Have another category you want us to consider? Email us at info@nullcareerdirectors.com with the suggested category for consideration. 1. Maintain a recognized overall resume certification that required testing (e.g., CARW, CMRW, CERM, MRW, NCRW, CPRW, CMRS, CRS (Canada, not this credential), MCRS. (1) Portfolio of 4 industry-specific resume samples. To demonstrate your grasp of a key industry specialization, you will provide four sample resumes. The resumes are to be for different positions within the industry to showcase your versatility. For example if you were applying for the Certified IT Resume Specialist, then the certification committee would like to see a diversified portfolio that may include: a Helpdesk Operator, a Programmer, an IT Manager, Database Administrator, etc.. For Healthcare, it could be Pharmaceutical Sales, a Nurse, a Practice Manager, a Physiotherapist, a Lab Technician, etc. The choice is yours as long as the resumes you submit demonstrate the breadth of your expertise in that field. RE: Australia Public Service – These submission requirements are slightly different. Ideally, we would like to see four full applications (resumes, key selection criteria (KSC), and cover letters). However, the KSCs are the mandatory element that must be present. Submissions will be accepted with KSCs only. What you know about this specialization in your own words. Pay the credential registration fee of $197.00 each for specialization. Submit all materials in MS Word or PDF format via email. As with the sample portfolio, you can include it all in one document or as individual documents. To ensure proper processing make sure that you tell us what specialization for which you are submitting. Additionally, make sure the saved name of each document includes your last name. (e.g., Johnson_Essay.doc, Johnson_ITmanager.doc). This is for our tracking purposes, but your name will be removed to maintain confidentiality of identity in the blind review process by our certification committee. Note: Resumes that use unique or unusual fonts should be saved to preserve fonts as graphics before being submitted in MS Word. If you have any doubt, we recommend you save it as a PDF. Upon receipt, your application materials will be submitted blind to members of the certification committee for review and approval. Standard review and evaluation period is 2-4 weeks upon which you will be notified of the final status of your application. Portfolios not meeting the standards of the CRS credential will be counseled on an individual basis to determine appropriate steps for remediation. Should more than one additional submission (recognized as a second portfolio) be required to fulfill the needs of the CRS credentialing process, an added processing fee of $35 will be applied. Upon committee approval you will be conferred and awarded the specialty CRS designation, which will include use of the specific logo for print and web, and certificate suitable for framing. NOTE: A differently worded logo is awarded for each different Specialist designation to appropriately denote your expertise. The CRS process allow you to take as long as you need within one calendar year of registration. However, it should take a very short amount of time to gather together the resumes as this is primarily an administrative record-keeping process. Please be advised that you must maintain an active CDI membership to complete this certification. You’ve always known you’re unique in what you do… Now prove it to the world by focusing on your brand as a Certified Industry Resume Specialist. All requirements of CRS certification, renewal, and CDI membership standards must be maintained in order to earn or retain a CDI credential. CDI reserves the right to revoke a CRS credential for any of the following: Renewal requirements are not maintained and completed within required timelines. Membership lapses due to non-renewal. Individual is found guilty in a court of law for a grievance within the industry (unprofessional, unethical, unlawful conduct and/or business practices). For more information on the CRS credential, contact CDI at info@nullcareerdirectors.com. The CRS+IT credential played a key role in helping my company to win the bid to provide career services to a university with 51,000 students. I have been transitioning my company from resume writing to more career coaching and branding over the last 4 years– and this project is 80% coaching with resume supplementing. While other firms who bid were coaching heavy, we were able to present strong coaching and strong resume writing expertise. This special credential was extremely critical as the first set of students we will be working with are in IT and ITSM, and the university wanted people who understand the unique challenges they face. We were the only firm with this certification who bid, during the interview they focused heavy on certifications, which was critical as it showed our commitment. View the Top 10 Reasons You Need a CDI Certified Resume Writer of reasons why job seekers choose to work with CDI certified resume writers.